Imperial Settlers: I keep hearing a lot of good things about Imperial Settlers but for some reason it hasn’t been a draw with my local game group so I’ve not had an opportunity to play. Star Wars Imperial Assault: Star Wars and Descent 2, in the same game, and it doubles as a miniatures skirmish game?! It’s only just hit the shops here in the UK so I’m not sure if you could consider it a full 2014 release but I’m really looking forward to trying it out. Dungeons & Dragons 5th edition: I don’t play rpgs anymore but Dungeons and Dragons is a key part of my gaming history. The new 5th edition looks glorious with beautiful artwork, the right depth of rules and even a free version. Infinity 3rd edition: I’ve played about 20 minutes of Infinity’s Operation Icestorm starter box and like the free tasters you get at supermarkets; it was enough to make me want more. I’m not sure there’s room in my life for another miniatures game (what with X-wing and Warmachine taking up most of my time in that regard) but something about Infinity is dragging me in. Technically Mai Star, a game about collecting patrons for a Geisha house, came out in 2010, but AEG released this Japanese game to Western players this year. Mai Star is a kind of set collecting, take that card game where the aim is to claim a chain of high scoring guests but to do so requires setting up your patrons while stealing guests and patrons from the other players. It’s quick to play and its basic premise of being over when a single player runs out of cards creates some interesting situations; go for the easy points now in case someone ends the round or try and set up a big scoring combo. Okay, I’ll come clean, I’ve still not played the physical version of this game, but I absolutely love it (and of course you can watch me play it). Its Ameritrash gaming at its best, run around the world, rolling dice, killing monsters and completing quests, it’s just like the Witcher books without any of Geralt’s womanising. If you are a fan of the Witcher novels or video games then you’ll get even more out of the game as it references all kinds of monsters, characters and events from the Witcher lore. When I wrote a preview of [redacted] during the game’s development, I described it as like playing multiple games of Battlestar Galactica at once, and I stand by this comment. The game is full of hidden information, from your team, what weapons you hold and where the important intel and explosives currently are. 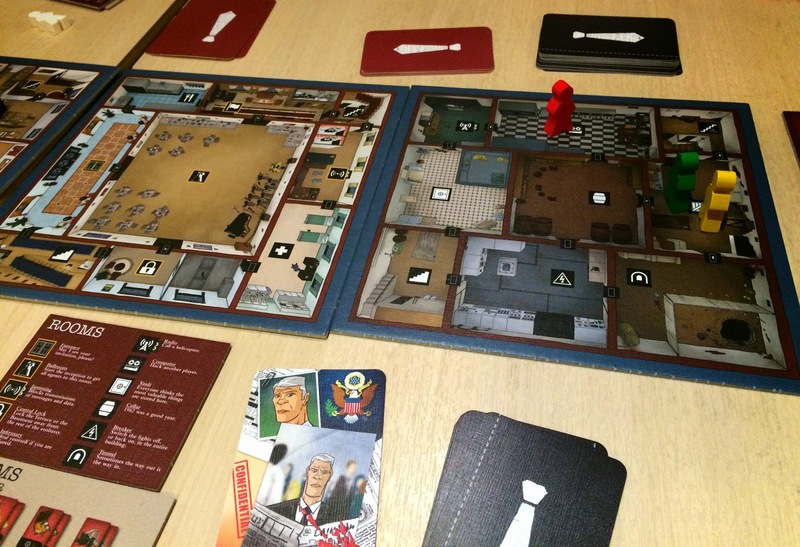 The game presents you with many scenarios to play but the main game has you attempting to get the enemy’s intel out of the ambassadors mansion or blowing up the opponent’s helicopter. It’s a game full of deceit where you attempt to work out who is on your side, who’s holding what and trying to communicate with your ally from across the table via a complicated series of subtle winks and eyebrow movements. It’s a worker placement style eurogame with a twist, the twist being you have to research and develop potions using your smartphone and such a simple twits really does elevate Alchemists from humdrum euro to something unique. It may be set in a typical fantasy world but there’s more than a touch of Terry Pratchett’s Unseen University as you research ingredients, brew up potions to sell to heroes and publish high scoring papers, all while trying not to poison your students or worse yourself. Although the game can be played without a smartphone, using the app really does make the game more interesting. 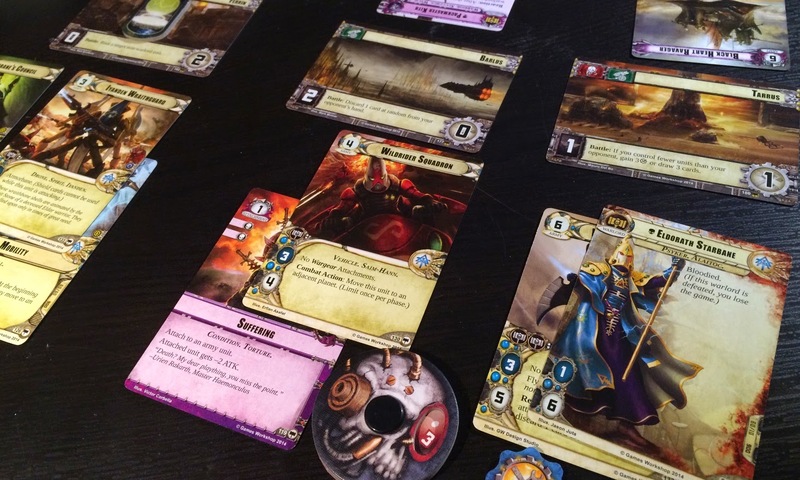 I'll admit that I was expecting more from this game, the latest LCG from Fantasy Flight Games that brings the iconic universe of the Warhammer 40,000 setting into card driven struggle for territory. It has a lot of great features and feels like you are controlling an entire of battalion of the 41st millennium troops, dispatching them and your commander to key planets. The game is absolute tip top, simple to learn, dynamic and quick to play but Conquest is hampered by spreading the starter box across seven factions which means a large outlay if you want the customisation a game like this requires. Keep an eye on Conquest though; because once several expansion packs have been released this game is really going to come to life. If you want to know more then check out my full Warhammer 40,000 Conquest review. Splendor is an unbelievably simple and quick game to play. Combining elements of Ticket to Ride and Dominion, Splendor has you buying gems to build up your stock of gems to buy more gems. Not only is it easy to learn its also a premium product, counters that could be simple cardboard discs are heavy poker chips give that game a tactile feel. 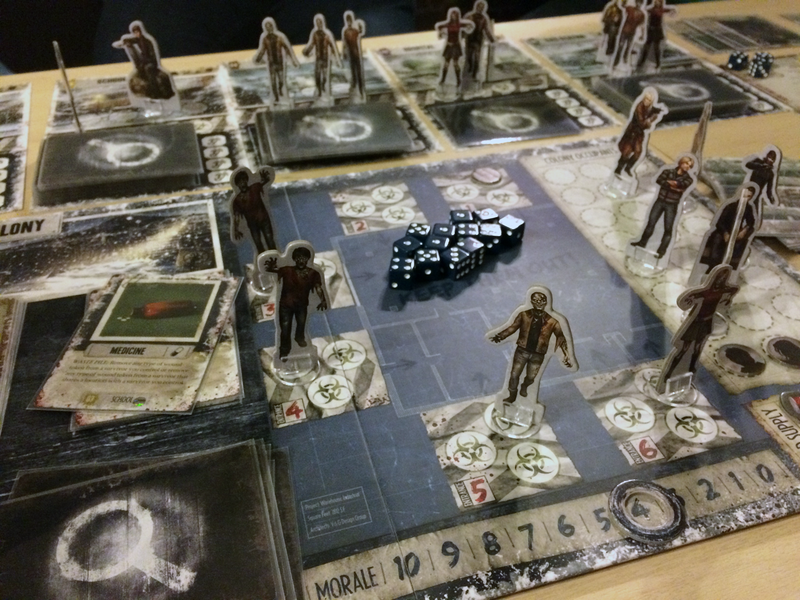 I've heard people use the term "The Walking Dead the board game but with more snow" to describe Dead of Winter but to me, this game is the distillation of a Stephen King novel in card board form, changes the zombies to weird monsters and this game would play like a board game version of The Mist. A cooperative game where the last survivors of the zombie apocalypse are holed up in the town's school house has players making daring raids into town to grab supplies to fight off the freezing cold as well as the undead hordes. Some elements of the game don't quite work in my opinion but the cross road system, a set of cards that trigger major events when particular criteria are met, is the real drive of the game and turn it from an average co-op to a game you'll be telling stories about. 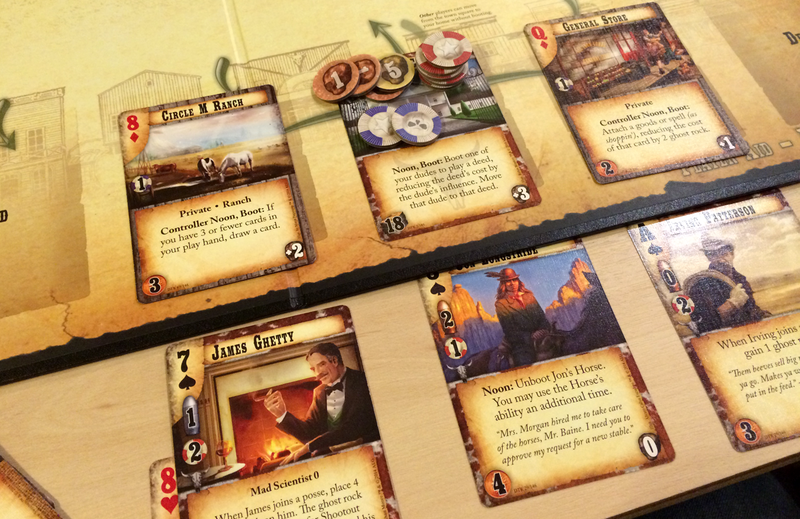 Doomtown Reloaded, is hands down (pun intended), the best game of 2014 for me. A living, sorry, expandable card game, set in the old west, with a some steampunk and black magic thrown in for good measure. Doomtown is brilliantly thematic, with cards moving around a steadily growing old west town but its the use of poker hands to resolve combat that is the real winner, adding to the theme and meaning that deck construction isn't just about using the most powerful cards but also about stacking the deck.